So, last Tuesday, my machine arrived back home after its extended hospital stay in Iowa. Scott and I spent the remainder of Tuesday and all of Wednesday putting her back together. That was a long and stressful job. The carriage got some new wheels, so that had to be done before the sewing machine head could go back on the carriage. This is a close up of one of the wheels. Once that was done, the machine head, which weighs somewhere around 60 pounds, had to be reconstructed, meaning the light and the handles and the wheel axels had to be put back on, and then the whole thing slid onto the carriage. Did I mention it was Scott and I doing this? By the time al the re-assembly was done, it was late Wednesday afternoon. I’d done a test run just to see if she turned on and functioned, which she did, and called it a successful day. Oh, did I mention cleaning of the table of the long arm frame???... I thought not. 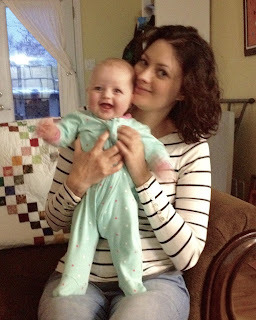 Thursday, we got to spend the afternoon with Abbie, since Becca had appointments during that afternoon. 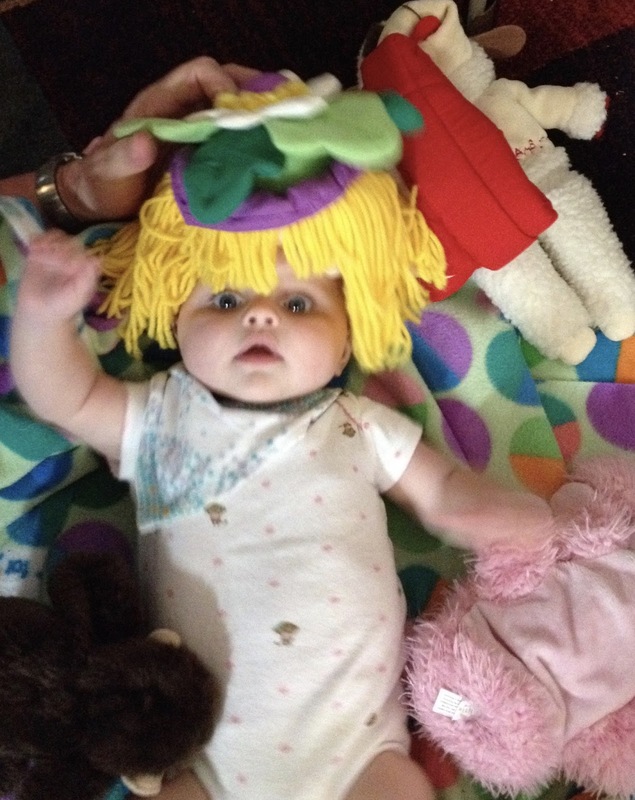 Grampy indulged in some silliness, deciding to try and see what Abbie looked like with hair, not very successfully. She has gotten quite mobile, just in the last couple of days, with figuring out how to turn from her front to back and then back to front. She now knows she can get places doing that. The days of being able to put her down and thinking that she’ll stay in one spot are gone. After Becca got home, I went and gave the machine a test run. All I can say is WOW! I have been working with a seriously crippled machine for a very long time! She now runs so smoothly and so quietly. In no time at all I had the baby quilt that was on the frame finished. Friday I loaded a customer’s quilt, and other than the small glitch of the machine falling off the rails because I forgot to tighten on of the bolts, she ran beautifully. Tomorrow, I get back into serious work and try to get caught up. I got so involved in the gorgeous day yesterday, that I didn’t get around to writing this post until today. I’m currently sitting out again on my swing, same as yesterday, enjoying the summer weather that has finally arrived in southern Ontario. My husband is out cutting the grass, and it smells so good!! This is what I was stitching yesterday. I’m appliquéing the star to the background. It’s draped over the back of my swing. The star points are six inches on the straight sides of the papers. Here’s a closer look at that star. I’m really liking the way it seems to be floating on the background fabric. 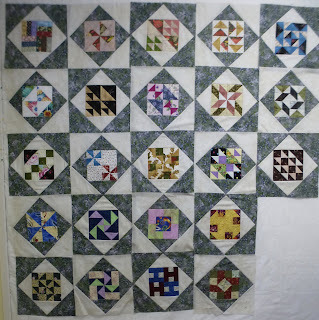 It’s going to be surrounded by different pieced hexagons, followed by a border and then more pieced hexagons. While we were away last weekend, we made a stop at a little quilt shop in Port Elgin. I picked up 11 different red fat quarters. 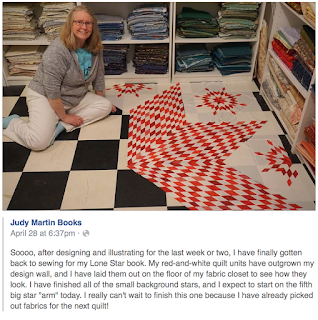 Judy Martin is in the process of writing a new book, all about Lone Stars. She posted a picture on Facebook of herself sitting with one of the quilts for the book that she has partially pieced. It’s another case of love at first sight, for me. It will be a while before her book comes out, so I have time to start collecting the reds I will need. That means my stash has grown a bit more. Today is a holiday Monday for us here in Canada, so I’m going to spend mine playing with fabrics. I have almost all of the alternate blocks for my Sisters Across the Miles done. So I’m going to finish those up today, and then get to work on finishing the Sister’s Choice variation blocks. 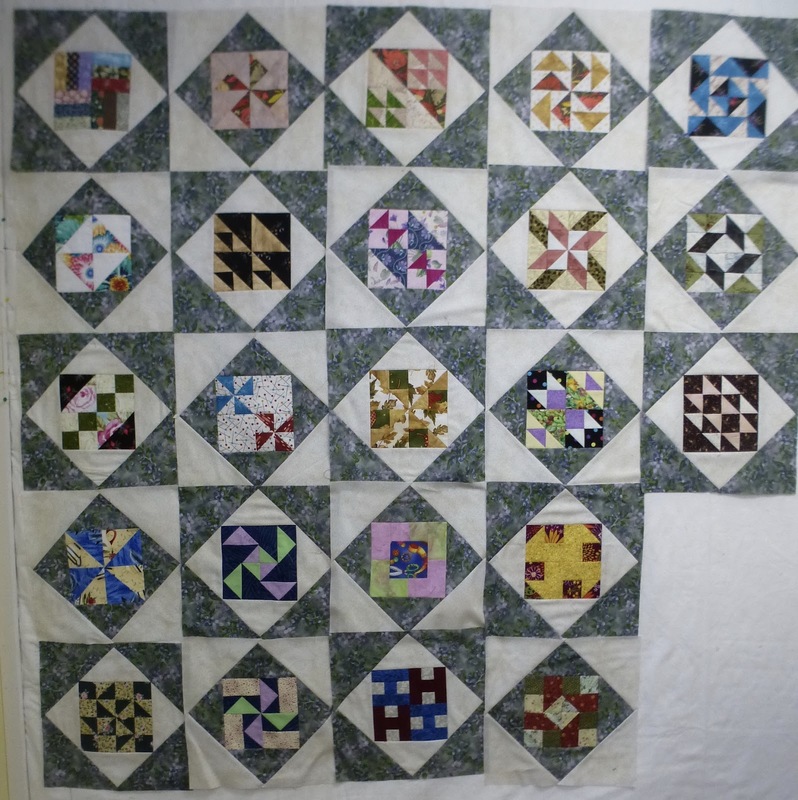 I am hoping to publish a pattern for this quilt, so I’d best get moving. I’m linking to Judy’s Stash Report. and building lego here. Noel was with us for most of the weekend, but he had to go back into work for Monday. He came back up Monday evening, so it was just Scott and I and Avery on Monday during the day. Even though it was still quite chilly out, we decided to go into Port Elgin for the afternoon. Here are Scott and Avery drawing the sun and the planets of the solar system into the sand. Avery knows the names of all the planets, and the order they come in. Scott started off doing the drawing, with Avery telling him what went where. And then Avery took over the drawing process. We got home late afternoon on Tuesday and spent that evening and the next day unpacking and trying to re-organize the trailer and the stuff that’s stored in it. Matt and Becca have taken it out for this long weekend, The weather is predicted to be much better. Almost perfect, in fact. It’s their first camping trip out as a family of three. I’ve been spending the last couple of days trying to put order into the chaos of my sewing studio. There wasn’t a flat surface anywhere that didn’t have something spread all over it. My long arm is due back on Tuesday, after being in the long arm hospital in Iowa for three weeks. I am so hoping that everything will flash up and work beautifully once everything is put back together here. However, none of that putting back together could happen with the table looking like this. I have stacks and stacks of leftover pieces of batting that have been trimmed from quilts over the years. Today was the day to do something about it. So I sorted them out according to type of batting and size of batting and then started using the fusible tape to piece them together. 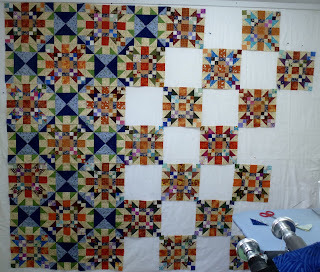 After doing that I now have four pieced batts measuring around 90x100. There is nothing else that I need do this weekend, so I think I am going to enjoy the glorious weather and do some sewing on my projects. I’m hoping to get at least one of them finished before Tuesday. After that, it will be a solid day or two getting the long arm put back together onto the frame. I’m looking forward to having it back and up and running again. It’s been out of commission for 6 weeks now. Somehow it feels longer than that. I am so far behind where I had planned to be with all the customer quilts I have, not to mention my own. I will be working hard to get them done. Anyone reading this who have quilts waiting here, I deeply apologize. Sunday Stash and Stitching report. Now that La Passacaglia is finished, it’s time to start working on a new hand project. 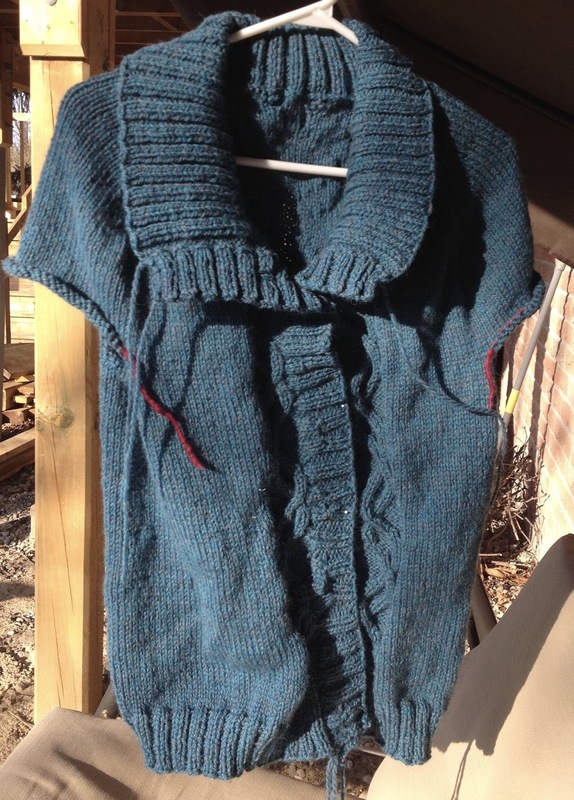 Last November Karen, who blogs at Faeries and Fibres, did a trunk show and workshop at our guild. She has a unique set of designs for doing hexagons, which I’ve been itching to get at. But I kept putting it off until the beast of La Passacaglia was finished. 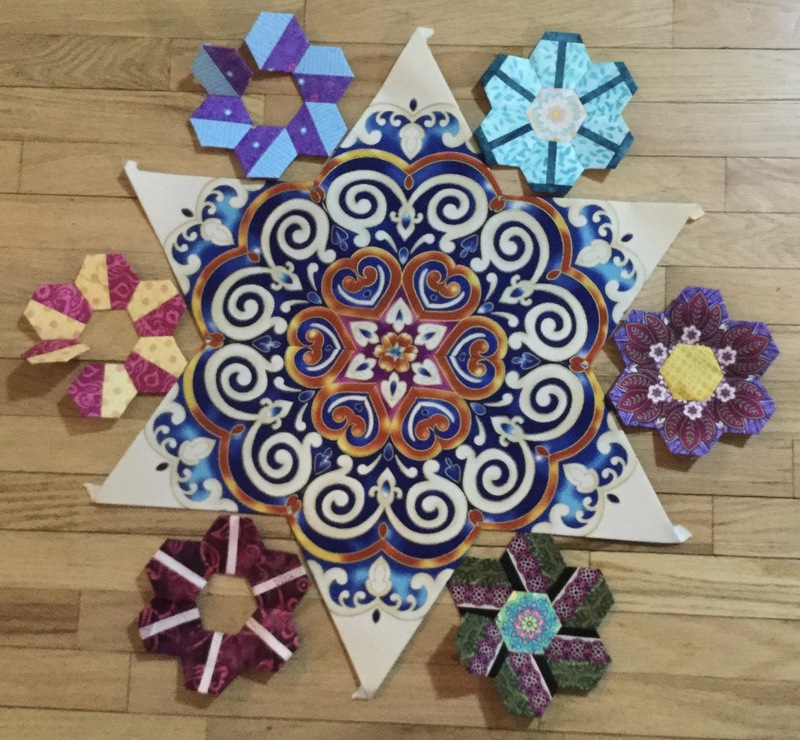 The centre star section of this piece was started when I decided I would take part in a mystery hosted by Tonya at Hillbilly Quilt Shop. I never managed to get any further than the centre, so I thought I could use it for this workshop piece. This is the basic layout I’ll be doing. There will probably be some sort of a border and them more hexagons around the outside. I’ll probably appliqué them down to a background. I had some fabric come in this week, but my used numbers are keeping up. 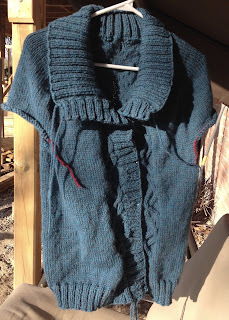 I’m linking up to Judy’s Stash Report and Kathy’s Slow Sunday Stitching. 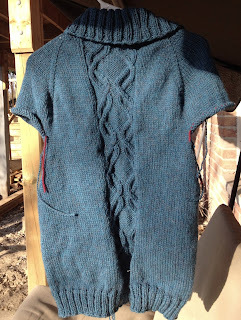 I’m linking up with Judy’s On the Needles. It can be dangerous sometimes, seeing what Judy is working on. When it comes to things knitted, she and I seem to have very similar tastes. I usually really like whatever it is she’s working on. Today is no different. She’s got a sweater going that I’d love to do. I’ll stick it into my Ravelry favourites. But considering there are over five pages of patterns saved there, I don’t know how I’ll ever get to all of them. But they sure are fun to look at. Life here continues to go on at the speed of light. It seems like there simply are not enough hours in a day to do everything. I know for sure that I’m not the only one with this problem. I have been meaning to write up a blog post since last Friday. But every time I think of it, something else comes up, and before I know it, the day is finished, so I think to myself, I’ll do it tomorrow. and of course the same thing happens. Now this past weekend, there was a good reason for it. 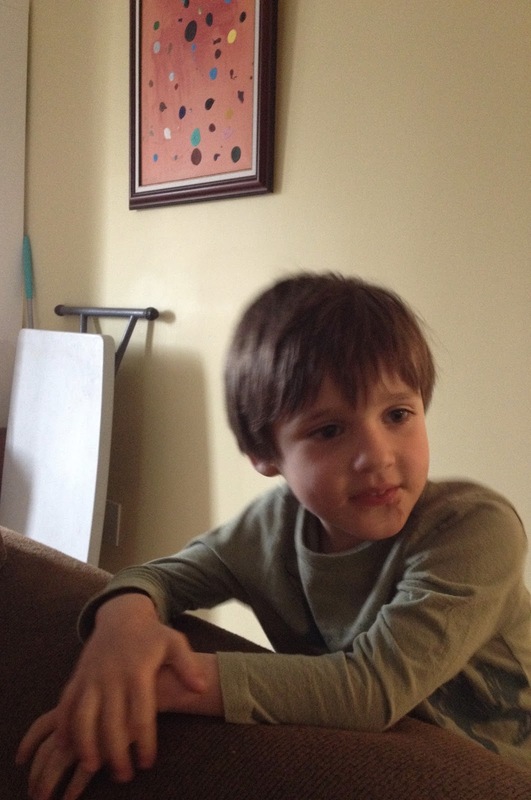 Our little grandson Avery was here for a visit. Except that he’s not so little any more. He is full of energy, that boy. This os the only good picture of him that I managed to catch. Of all the pictures I took, although there weren’t that many since I was too busy enjoying having him around, they were all blurry because he was moving so fast. He left to go home Sunday afternoon. I was going to do up a Sunday stash and stitching report that day, and for the life of me, I can’t remember even what I did for the rest of the day. Oh right, now I remember, I spent quite a bit of it talking to friends on Facebook chat. Monday, I spent quietly stitching and trying to get my breath back after the weekend. I’d planned on doing the stash and stitching post that day...... didn’t happen. Tuesday I spent up in the sewing room, working on one of my own projects, interspersed with emails back and forth to APQS regarding the state of my long arm machine. Preliminary diagnosis is that it needs a new motor. I haven’t heard anything since Tuesday when they were planning on putting in the motor, so I’m wondering if they’ve come across the other weird things the machine was doing before I sent it in. I think this is the fourth week without it now, which means I am four weeks behind in all the customer quilts I have waiting here. If you are one of those, I profoundly apologize, but there is nothing I can do, at the moment. 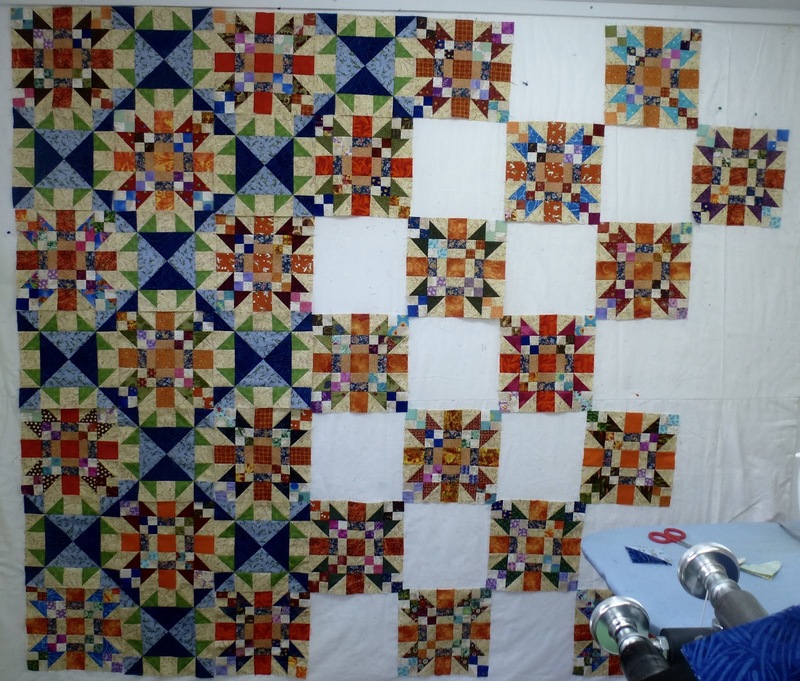 When I do get it back, the focus will be on getting all those quilts done. This is the project I was working on Tuesday. It’s one of my own designs, done up in EQ7. It’s a variation of the Sister’s Choice block. I’ve decided that I’m naming it “Sisters Across the Miles” in honour of my friend Susan in Alberta. I’m seriously contemplating publishing some patterns. I have 5 or 6 that are my own designs that I could write up. The hows and whens are details yet to be figured out. Our son is a fabulous photographer who has offered to do up pictures of the quilts and his girl friend is a web designer. I’m not sure at the moment whether I’ll add them to this blog, or actually do up a website. These are excitingly scary thoughts. At the moment, the trick is going to be finding the time to get the patterns written up. 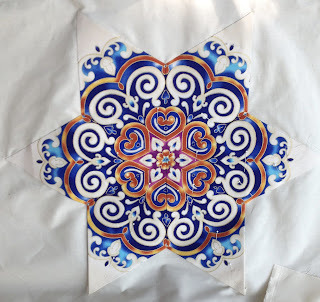 So, this take me up to yesterday which was also partially spent sewing in the studio, working on the sampler quilt that I’ve designed as a free project for the guild’s blog. The picture here is a bit washed out. I’m trying to stay as far ahead of the publishing dates as I can. 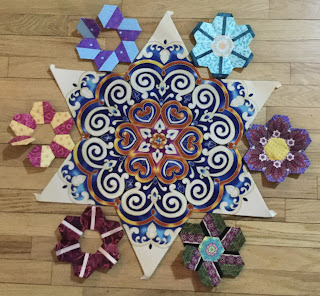 It would really be great for this to be done in time for the quilt show in October so that everyone can see what their finished quilt can look like. 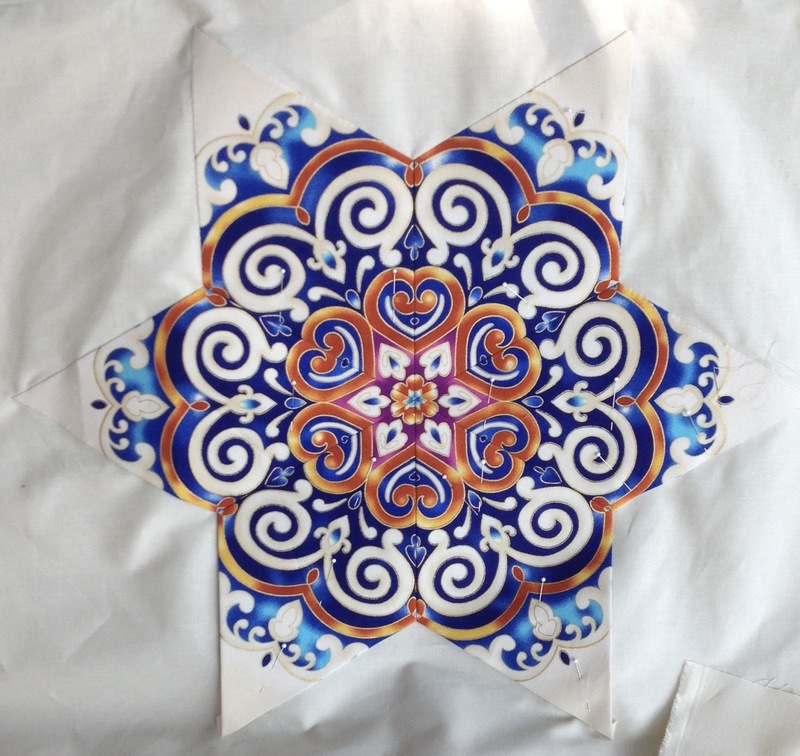 The instructions for it, should you be interested, can be found on the London Friendship Quilters’ Guild blog. And of course, in amongst all this has been lots and lots of visits and hugs and snuggles with our precious grand daughter Abrielle. She is 4 months old today. How that went by so fast is totally beyond me. Here they are, our daughter Becca and grand daughter Abrielle. So now, after catching up here, I am going to link up to Lorna’s Let’s Bee Social and then go get some more work done on that blog sampler.